Two prominent software security programs face off. Which one should you allocate your invesment dollars to? FireEye, Inc. (NASDAQ:FEYE) and Check Point Software (NASDAQ:CHKP) each supply advanced appliances and software solutions in the field of cybersecurity. Check Point offers network and endpoint security and aims to "secure the Internet." FireEye focuses on advanced threat detection and prevention, as well as incidence resolution technology. Both are highly visible and well-regarded organizations in the security sector. But which makes for the better investment? Data source: Check Point and FireEye SEC annual report filings, 2012-2015. *Not applicable as FireEye does not yet have positive earnings on which to base price-to-earnings comparisons. Check Point was incorporated in Israel in 1993, and its maturity shows. As one of the very first -- and oldest -- network security companies, Check Point has tallied a decent, if not pulse-raising, revenue compounded annual growth rate, or CAGR, of 8% over the last three years. Similarly, profits have increased at a modest CAGR of 4%. But what catches my eye, and perhaps yours as well, is Check Point's extremely high profitability. An operating income margin of over 50% is quite rare, even for a software company. In trade for moderate growth and profit expansion, a shareholder in Check Point can bank on extremely robust profits each quarter. That's quite appealing to investors with long holding periods. Scanning over the same information in FireEye's column, revenue growth is a standout metric. FireEye has continued to add customers and sales at a heady pace since its debut on the public markets in 2013. But to create this order of top-line expansion, FireEye has invested heavily in research and development while incurring a high cost of sales, and has yet to generate positive net income on an annual basis. 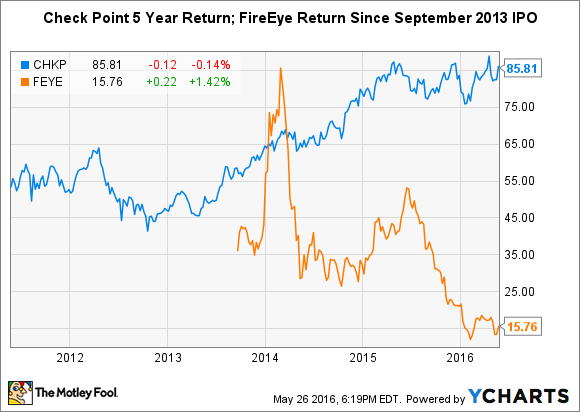 In fact, FireEye's three-year revenue CAGR is exceeded only by its three-year loss CAGR. That is to say, the 96% annual average improvement in sales is topped only by the 147% annual growth rate of the company's losses. In the software industry, and indeed within the subsector of cybersecurity, investors value revenue increases but also demand some visibility into future profits. That FireEye continues to rack up losses while producing either negative or marginally positive operating cash flow each quarter has rattled its investors as of late. The chart above is indicative of some idiosyncrasies surrounding FireEye's business, in particular, its unique approach to security software. Rather than provide firewall protection or traditional intrusion prevention systems, FireEye's products guard against advanced threats in a virtual software environment, leaving an organization's native systems uncompromised. Thus, the company's software isn't top of mind as a foundational security solution, and some customers buy FireEye's offerings only when a significant corporate hack is widely publicized. Similarly, investors' interest in the company tends to rise in direct proportion to the buzz around global security threats. Management is well aware of this cyclical, news-driven phenomenon. In its annual reports, FireEye even acknowledges the risk that if the level of advance threats from rogue outfits, state-sponsored security hacking, and corporate espionage agents decreases, the company's business could be materially impacted. Check Point's software is closer to what a typical corporation reaches for when building a security solution to protect vulnerabilities enterprisewide. Check Point successfully bundles appliances and software "blades" to provide a comprehensive security option. While it's still very much a network security leader, the company has also branched out in the threat detection market, albeit using different technologies than FireEye. This year, Check Point's latest suites of security appliances are especially optimized for threat prevention. After introducing the data center and high-end 15000 and 23000 appliances last year, the company followed up with the small and midrange 1400, 3000, and 5000 series, which come out of the box with a full threat prevention suite enabled. Ultimately, which stock is the better buy? While Check Point may be the much more mature company, it's no slouch as an investment. Since the FireEye IPO nearly three years ago, Check Point stock has returned 48%. Compare that to FireEye itself, which has lost 56% cumulatively since going public. Despite its operational losses, FireEye shows a great deal of promise due to its ability to capitalize on a rapidly expanding niche market. But a return to an ascending stock chart will hinge on management's ability to control costs and squeeze higher revenue from current levels of selling expenses. The company is countering the cyclical sales weakness discussed above by developing long-term relationships with clients via multiyear contracts. It's also refining its skill in selling advanced solutions to multinational corporations and government entities. In the company's most recently earnings call, outgoing CEO Dave DeWalt noted that FireEye's largest transaction of Q1 2016 was an eight-figure contract with a U.S. federal entity to protect more than 100,000 email addresses. Conversely, Check Point can already point to a plethora of large, long-term clients; its continued success rests on its ability to innovate, while maintaining a reputation as an industry leader. Recently, CEO Gil Shwed promised that the company will soon extend its cybersecurity platforms into markets such as the Internet of things (IoT), national security, and critical infrastructure. Check Point has a long track record of successfully evolving along with market trends, so investors have a reasonable assurance that it will indeed capture crucial market share in cybersecurity in the coming years. An extremely healthy corporate balance sheet is well capable of supporting further market expansion. Considering all factors, FireEye will remain a somewhat speculative investment until the company can string together several profitable quarters. Check Point, despite a sleepier reputation, has proved a winning holding over the last few years. While both offer compelling reasons to invest, for the near future, Check Point will remain the better buy.